Silage is vital to the cattle industries. 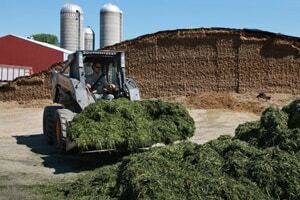 The smell of silage on any cattle operation brings a sense of habitual chore time activities. However, silage bunkers and silos have unique hazards, like silo gas, dusts that may contain mold, avalanches, falls, and more. Silage gas formation during the fermentation process has lethal potential, especially with silos. Take precaution during crop production, during ensiling, and when working with silage to keep everyone on the farm safe. Below is a general safety checklist that applies to both silos and silage piles/bunkers. Scroll down to view custom checklists for each storage situation. Are you scheduling a team meeting to talk about potential safety hazards? Make sure everyone understands their roles. Do silage harvest teammates remain in their tractor/truck and wear neon yellow? Are silos/piles/bunkers constructed to proper dimensions and filled within capacity? Are you cautious of exposure to gases and dusts when working around silage? Are you using the buddy system when working around a silo or bunker so that you are not working alone? Is the storage area marked with signage? You and/or your employee(s) can download and print a pdf checklist below to complete safety checks on your farm. Keep the completed forms for follow-up, future reference and inspections.